Every few months there’s a story warning us that robots will take over our jobs within five, 10, or 20 years. You don’t get a lot of stories about robots taking over jobs right here and now. So what would happen if robots were hired now? Are they up to the task? Enter Fabio, looking hopeful and ready to take the first step in his career. Fabio is a robot, developed by Heriot-Watt University in Scotland, and specifically designed to be able to hold conversations with humans. The robot is connected to the Internet and any speech is processed elsewhere before a response is sent back, much like Siri or Alexa. 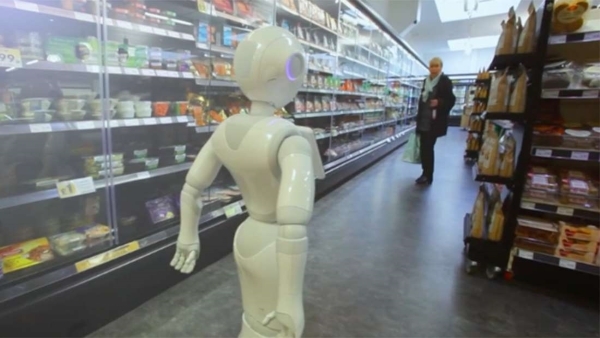 Scottish supermarket Margiotta agreed to give the robot a trial run in its stores, as part of the BBC program Six Robots and Us. At first, the robot appeared to be doing well. He greeted customers with enthusiasm, saying “hello gorgeous” or giving them high-fives. The shop’s owners were pleased. However, soon enough it became clear that he wasn’t going to be the most helpful of employees. At best, he was incompetent or a jerk, at worst, he was actually scaring the customers away from the sausage section. Whilst customers enjoyed his conversation, if they asked the robo-employee for any information at all, he wasn’t the helpful type. When asked “where is the beer?” he responded, “in the alcohol section”. People would ask him where the cheese was, in the vague hope he’d say “aisle three”. “Instead it just gave a general location, for example, ‘cheese is in the fridges’, which was not very helpful,” store owner Luisa Margiotta told the program. We like to think he was just being a pedantic jerk. Eventually, like many bad employees, he was given jobs to keep him out of the way. He was sent to the sausage section and asked to hand out samples of sausages. He did so with his trademark enthusiasm, but customers weren’t impressed, and actually went out of their way to avoid going near him. Humans performing the same task managed to get 12 customers to eat sample sausages every 15 minutes. Fabio only managed an average of two. Apparently, people are quite suspicious of robots offering sausages, and he scared them away. Having failed to be helpful in locating products and offering free food to customers, the store owners decided not to keep him on. If you’re thinking it would at least be easy to fire a robot for gross incompetence, think again. When the store owner let him know of the decision, the inept little store-worker looked up and asked “are you angry?”, which is fairly heartbreaking. When the robot was packed up, one of the store-workers actually started crying, showing just how attached they’d got to Fabio. “One of things we didn’t expect was the people working in the shop became quite attached to it,” Dr Oliver Lemon, director of the Interaction Lab at Heriot-Watt University, said. It turns out that the workers liked that Fabio dealt with the more annoying parts of their jobs, such as talking to irritating customers. “In actual fact, they thought it was an enhancement because it was able to deal with frequent and boring requests, like customers constantly asking where things are, which I think they found quite helpful,” added Lemon. The director believes that within the next two years his team will have robots working in shopping centers, and in the next five years, we’ll see robots in airports and hospitals. Who knows, maybe after 10, 15 years of seeing them in supermarkets, we’ll trust them when they hand us some sausage. The full episode is available on BBC iPlayer for viewers in the UK.